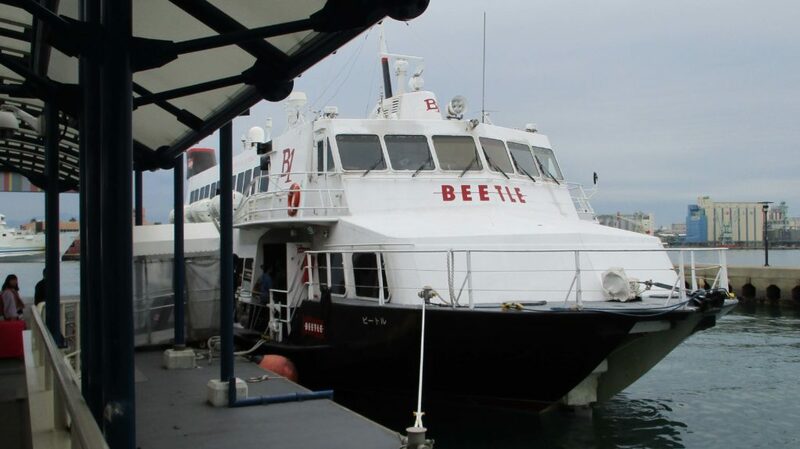 The JR Beetle is a hydrofoil service between Busan, Korea, and Fukuoka, Japan (and also Japan’s Tsushima Island), operated by the JR Kyushu company. For foot passengers, this is by far the fastest, most comfortable, and most convenient way to travel between Busan and Fukuoka (for the various car ferry routes between Japan and Korea, see here). These boats are fast, and it can be a bit of a roller coaster when the sea’s rough; the cabin crew are pretty strict about making sure you keep your seat belts fastened. 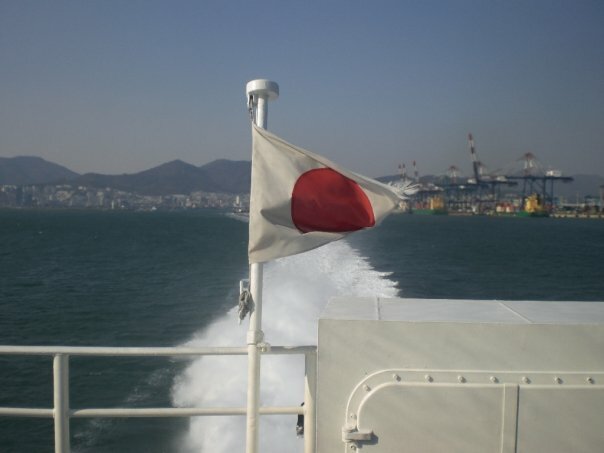 If you get seasick easily, you might want to take the Camellia Line car ferry instead. It’s possible to make it all the way through from Seoul to Osaka (or even Tokyo) in one day using bullet trains and the Beetle; it’s a bit of a long slog to be honest, and in terms of time and cost this isn’t remotely competitive with flying (unless you’re already using (or planning to) a JR Pass, and make this the last (or first) day of usage), but if you want to avoid flying it can be done. See below for details. The JR Beetle does 2 or 3 runs per day in each direction; there’s always a morning departure (usually at 8:30), plus one or two lunchtime/afternoon departures. The usual crossing time is 3 hours 5 minutes, though I’ve experienced boats getting across significantly faster or slower with favourable or unfavourable conditions. 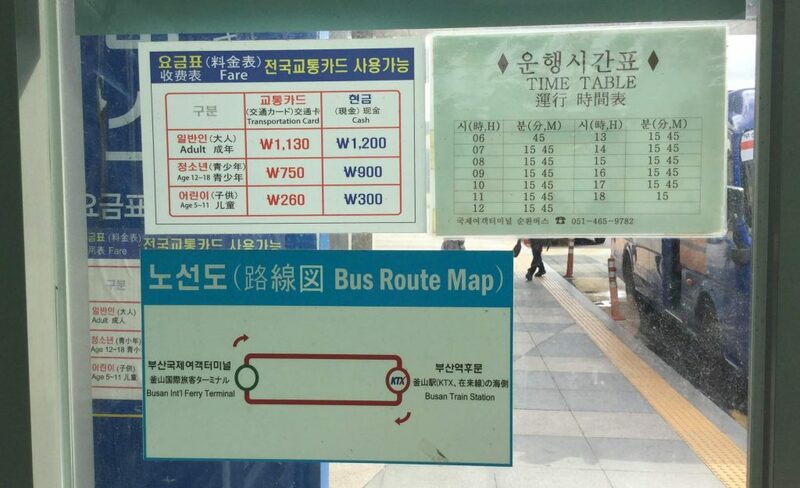 The regular one-way fare at the ticket counter is 140000 won from Busan, 14000 yen from Fukuoka; buying a round-trip this way doesn’t actually save any money as you just pay the one-way fare twice, but you can get really good round-trip deals by booking online. I’ve now taken the Beetle more than a dozen times, and there have always been plenty of seats available except when I travelled during Japan’s Golden Week holiday; holiday periods aside, you should usually have no trouble just rocking up and purchasing a ticket at the counter on the day. Of course this can never be 100% guaranteed, so you may prefer to book ahead anyway, and should definitely do so if travelling during holidays. It’s better to book ahead anyway to get the discount online fares – you can get the one-way journey for as little as 5,900 yen on the official site, though only on some dates. At other times the cheapest fare is usually 8,900 yen, in which case it’s cheaper to book with Direct Ferries who usually have it for 65 USD (about 7,000 yen). In any case, it’s definitely easier to use Direct Ferries as it’s all in English. Here’s a direct link to the Direct Ferries page – if you use this link to book, 4corners7seas gets commission from Direct Ferries (at no extra cost to you) and if they have the cheapest fare for your travel date it’s a win-win. Thanks in advance should you choose to support the site using this link (booking this way also removes the language barrier and avoids potential booking errors like the time I made a mess of reserving online in Japanese). So, if you’re after the cheapest fare check the Beetle website first, and if they have it for under 65 dollars book it there; otherwise, Direct Ferries will probably be cheaper. However if you’re booking a round-trip you can get it for just 4,900 yen each way on the Beetle site, so that’s the way to go. At this point, check the price on Direct Ferries; if the Beetle site’s at 7,900+ it’ll probably be cheaper to use Direct Ferries. And if that’s too complicated or doesn’t work, here’s the Direct Ferries link one last time. 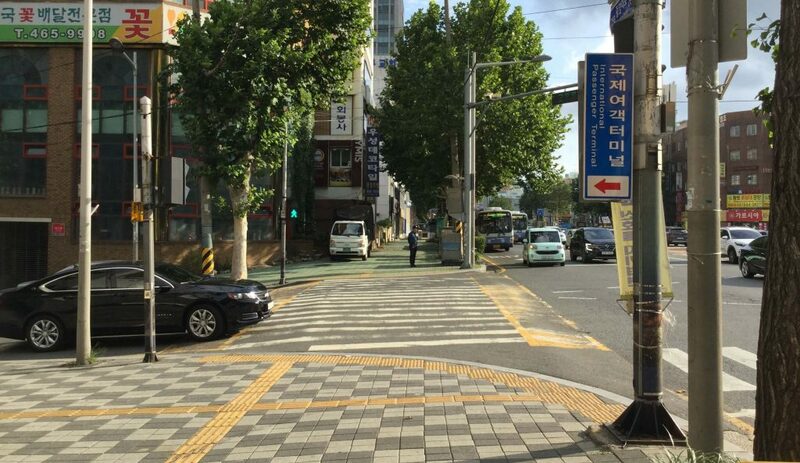 If it’s raining, just jump in a taxi and show him 부산국제여객터미널 or ask for “Busan Gugje Yeogaeg Teomineol”. The ferry terminal has good food and drink options available, as does Busan Station, so you can easily make a pit stop as you pass through. Checkin opens one hour before departure and closes 30 minutes before; you have to go through immigration so (if coming from Seoul) to avoid any stress I’d suggest timing your KTX to arrive at Busan Station around 90 minutes before departure, which leaves plenty of time to stroll over, perhaps grab a bite on the go, check in, and clear immigration; if you want to sit and eat some lunch, obviously allow longer accordingly. Port tax from Busan is 4,300 won (approx $4 US) payable at checkin only, so make sure you keep enough won on hand, and there’s an oil surcharge of 14,000 won ($14 US) which is tacked on to the ticket fare if you buy at the terminal (but if you already have your reservation paid online, you’ll have to pay this at checkin too); also be aware that when you arrive at Hakata you may have cash issues (the terminal has no international ATM and is a bus ride from the downtown area), so it’s best to get hold of some Japanese yen before leaving Busan (there are money changers in the ferry terminal). Alternatively if you have at least a few thousand won to change to yen on arrival it’ll cover the bus fare to get downtown (see Hakata Port, below). The fuel surcharge changes frequently, between 5,000 won and 14,000 won in my experience; the rate given here is correct as of late 2018. 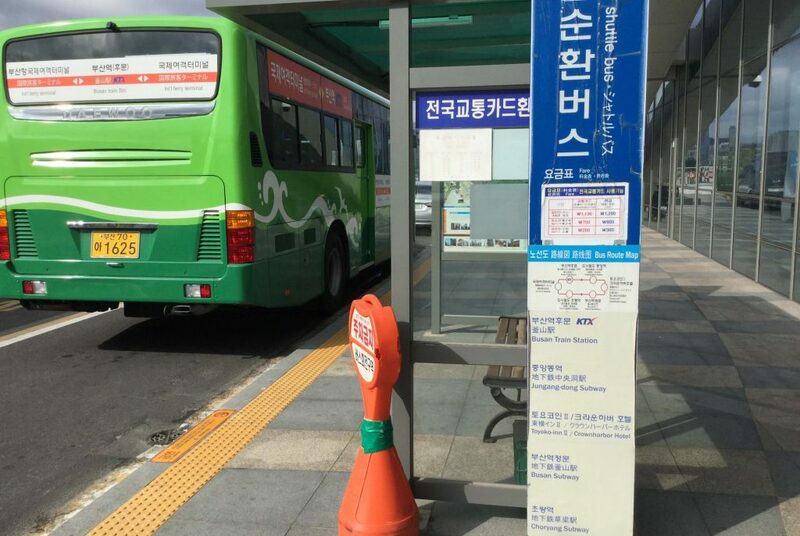 If you keep 20,000 won per person that should cover the departure tax & fuel surcharge in Busan. Access to Hakata Port from Fukuoka is well explained here; I’ve done both bus and taxi, the bus is straightforward enough but taxis are obviously easiest. The passenger terminal is a 20-minute or so bus ride from either Tenjin (central Fukuoka) or Hakata Station; the bus costs 230 yen, and you can take bus number 88 from Hakata Station (bus stand F, over the main road outside the west exit) or bus number 80 from the Tenjin area (bus stop 2A, located in front of the Solaria Stage department store on the west side of the main north/south road (Watanabe Dori, 渡辺通り) outside Tenjin station). Allow plenty of time if you need to locate these as you go, as it’s a pretty busy area and may take some working out / help from a friendly local. If you’re pressed for time, taxis are plentiful and should get you there in 10 minutes or so for around 1,500 yen – just show or tell the driver 博多港国際ターミナル “Hakata-ko Kokusai Taaminaru”. If you fancy it you can also walk it from Hakata Station in about 40 minutes, or from the nearest metro station (Gofukumachi) in about 20 minutes (just use Google Maps for the route). The food and drink options at the terminal aren’t so great, so it’s advisable to get that sorted before taking the bus (or just make do with the snacks and drink available on the ferry, which are basic but reasonable). Departure tax from Hakata is 500 yen (approx $5 US) payable in cash only from vending machines next to the checkin desk, and the oil surcharge is 1700 yen ($17 US, which is payable by cash or card) so make sure to keep enough cash in hand – especially given that the nearest international ATM is at the 7-Eleven store some 15 minutes away on foot. 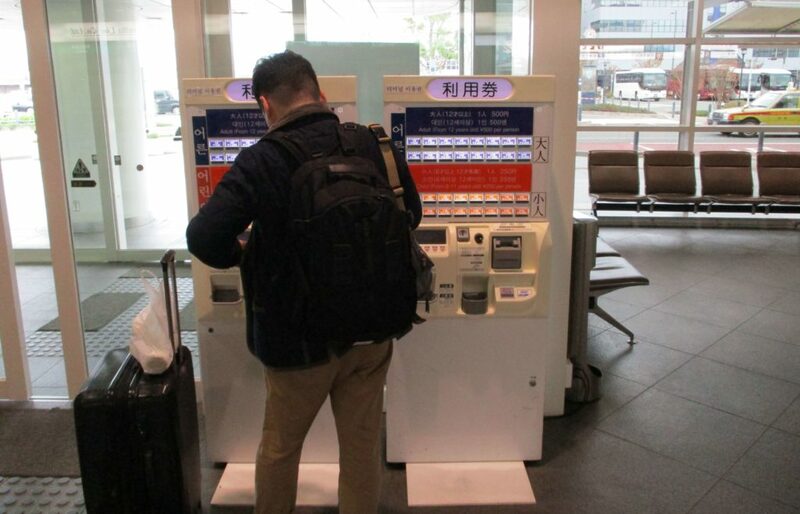 When arriving at Hakata, this can make things a little tricky – you’ll need 230 yen for the bus, but unless you have a Japanese account there’s no ATM you can use. Best solution is to get hold of some Japanese yen before boarding in Busan, or at least hang on to a few thousand Korean won which you can change at the money changer in the Hakata terminal (if you arrive in the evening the money changer will already be closed, but you can change it at the information desk); otherwise, you’ll have to walk to 7-Eleven, or take a taxi and have him stop at 7-Eleven on the way. Update: the information desk stopped changing money some time in early 2018, so if you’re arriving in the evening and don’t have Japanese cash or bank card you’ll have no option but to head to the 7-Eleven – ask the info desk for a map. If you have won to change there’s a money changer at Hakata Station (in the main concourse, terrible rates) once you manage to get there! The bus numbers when going from the terminal to Hakata Station or Tenjin are different than when going the other way, for some reason; for Hakata Station you can take numbers 11, 19, and 50; for Tenjin you can take numbers 55, 151, 152, and 80. Of course, things can change so double check on the website and/or at the information counter. Also, when arriving at Hakata Port be prepared for the likelihood of a tedious bag search and questioning session; they’ve searched me almost every single time, very thoroughly on a couple of occasions including swabs for ‘drug check’ (though they don’t actually appear to run those swabs through any machine, so I’m not convinced they’re genuine). The fuel surcharge changes frequently; rate given above is correct as of late 2018. Using the JR Beetle it’s possible to travel overland between Seoul and Osaka (or even Tokyo) in one day. I’ve done this between Seoul & Osaka several times; for the KTX from Seoul to Busan, JR Beetle to Fukuoka, and then Shinkansen to Osaka (or vice versa), the total time is 10 to 12 hours (depending on how you transfer to / from Hakata Port, and how long you allow for checkin & waiting times). Checkin opens one hour before departure and closes for boarding 30 minutes before, at which point you go through immigration. Try timing your KTX to arrive at Busan Station around 90 minutes before departure (or an hour if you know exactly where you’re going – but not any less), which gives you time to stroll over, perhaps grab a bite on the go, check in, and clear immigration; if you want to sit and eat some lunch, obviously allow longer accordingly (if needed, the food and drink available on board the Beetle is sold at reasonable prices, payable in both Japanese yen and Korean won). 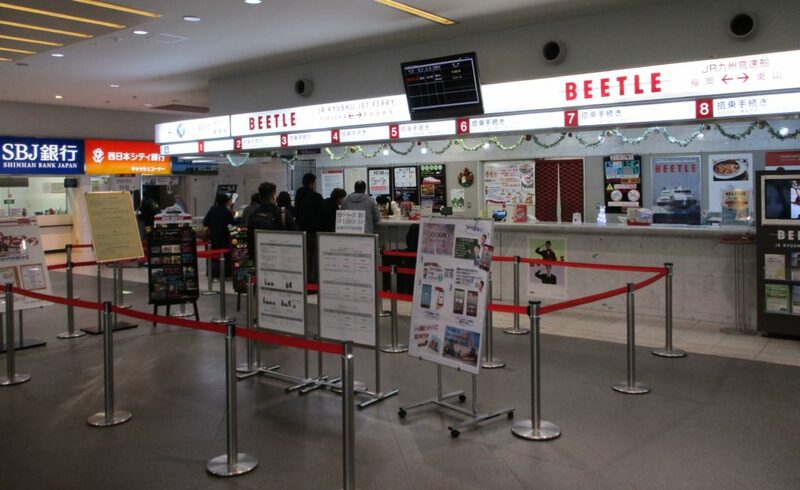 The 15:50 Beetle is fine for reaching Osaka, and also for Kyoto if Kyoto Station is your destination. However if you also need to transfer to another line in Kyoto it makes it tight, as the 20:01 Nozomi train and 20:08 Sakura train are the last ones that make it in time (the latter also requiring a change at Shin-Osaka from shinkansen to a regular JR rapid train). In other words a midday Beetle is advisable if you need to make a transfer in Kyoto! (or you can risk it and be prepared to take a taxi)… also remember that if you’re going to be using a JR Pass, you’ll need extra time at Hakata Station’s ticket office, so even the 20:08 Sakura is very tight, and you can’t take the Nozomi anyway, so if you want to catch a direct Sakura or Hikari from Hakata to Kyoto you need to be on the morning or midday Beetle. 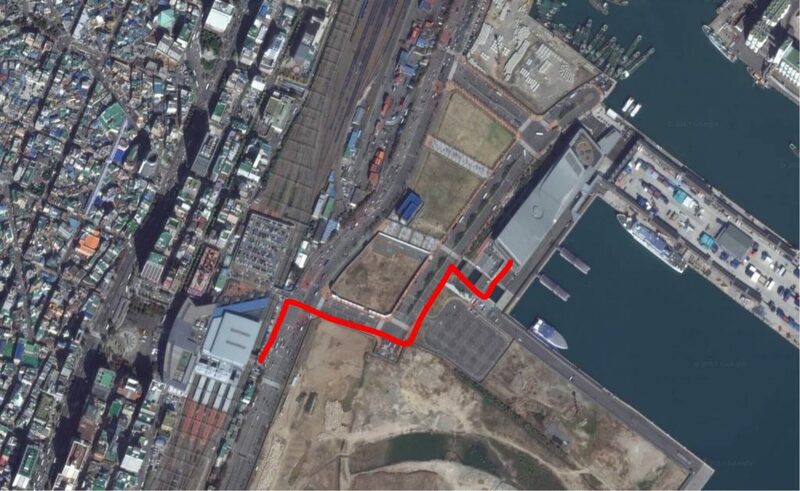 In the opposite direction, you need to allow longer for the transfer & checkin in Hakata; time your shinkansen to arrive at least 2 hours before your sailing time (90 minutes is fine if you take a taxi to the port), but then the transfer time in Busan should be really short (i.e. 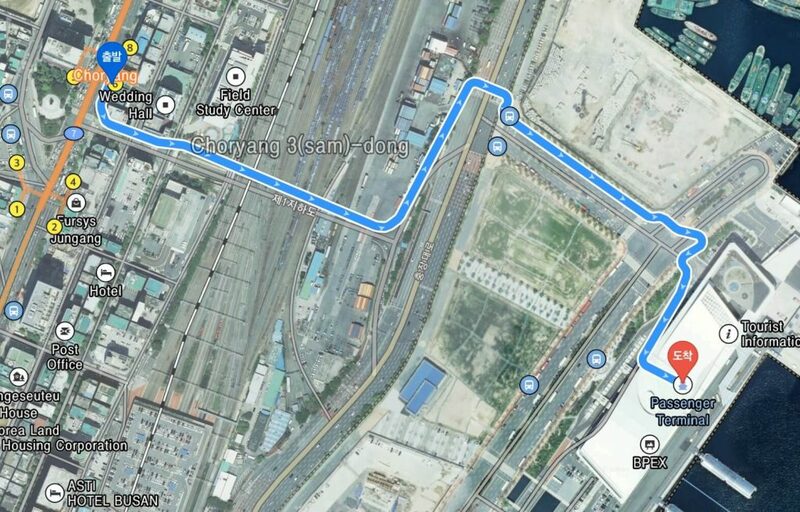 once you clear Busan immigration, which has always been a breeze in my experience, it’s just a 10-minute walk). 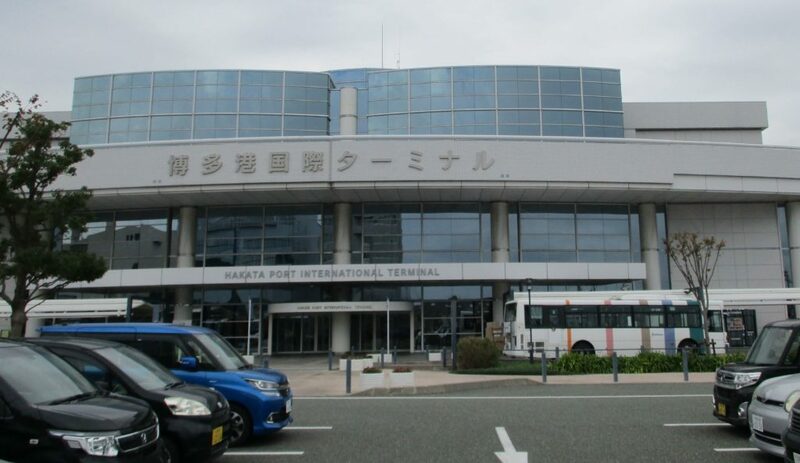 You could of course carry on right through to (or from) Tokyo this way; that would definitely make for a very long day, but the transportation is all comfortable and the day should be hassle free (other than the Hakata transfer) and it can certainly be done. Sailing out of Busan you definitely need to be on the morning or midday Beetle if you want to reach Tokyo the same day. Of course, the Beetle is also a nice fast way just to go from Busan to Fukuoka – both cities are well worth visiting in their own right and staying for a few days. Have you used the Beetle recently? Any changes or updates future overlanders should be aware of? Do you have any questions? Leave me a comment below and I’ll get back to you. A million thanks for the step-by-step guide to booking the ferry! I’d been struggling for days. Hi Anna, thanks for the comment and you’re very welcome – glad to hear it was useful, and I hope you enjoy the trip! so detailed and informative – taking a trip from Daegu SK to Fukuoka/Kumamoto – this was was really helpful…thanks! Hey Jamie, thanks for reading & commenting, good to hear it’s useful! Cheers Dhammika, you have a great trip! I need to buy the ferry from Hakata to Busan for April 8th. Is the “representative contact number” obligatory? How many digits must be in each space? Yes, the representative contact number is required. You can enter 4 digits in each box – obviously the number of digits might not be 12, but it’s ok to enter a shorter number. Be very careful to enter the correct departure port – I once accidentally booked a ticket from Japan to Korea when I was already in Korea! Big waste of money. I hope you manage to make your reservation – let me know if you have any further questions. In the confirm page it appears as I have choose “green seat” for me, but I haven´t! And I don´t knok where to change it. Do you know? Ready! I have changed the seat! I think I could booked! Some screens are different to your post. I didn´t find where to put my e-mail, so I don´t know how I did to get my e-ticket but I did! I hope it will be all ok!!! Really I don´t understand how I have made the reservation. At the final screen it causes “error”, bot I could get an PDF and I think it is the e-ticket. The charge appears in my credit card. But now I try to search the reservation in Beetle website and I don´t know if it is possible. I can´t find it. And I realise that I have not made an user member before the booking. Do you know if it is possible to access to the reservation? Thanks for the in depth detail regarding taking the beetle. It seems that they’ve changed the stop from 2b to 2a now. As I type this I am literally in the 80 going to the port. Cheers Johnny – it’s always been 2A! Hope you had a good trip over, enjoy Korea! Hi, I’ve just been reading your step by step guide and comments. To be sure, can I just check that when booking you are saying that I input the port that I will be in when joining the ship rather than the port I am heading to? Is it much more expensive to use the English based sites? Would you based on feedback, if I carefully follow your steps this is the best way forward? Yes that’s correct, you input the port where you’re boarding. So if you’re in Korea and heading to Japan, select 釜山発. If you’re in Japan and heading to Korea, select 福岡発. Thank you for the quick reply. As we wouldn’t be travelling until mid October, it’s a bit too soon to book yet (thanks anyway). Did you say that the 8.30am from Japan is year round? Still figuring out whether to take hydrofoil or fly. Hey there and thank you for the detailed description. “Only the JR-WEST Miyajima ferry is covered. No, unfortunately the JR Pass doesn’t cover the Beetle. Wish it did! Your instructions were so helpful! Thank you, Simon! Awesome, glad to hear it, cheers! Firstly thanks for this great detail about the JR Beetle service. I don’t think I could have figured it out without you. 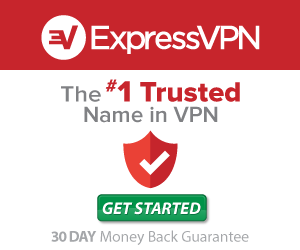 As you seem to use the service regularly, could you tell me how reliable it is? That is, how frequently does a crossing be cancelled or significantly delayed due to weather or operational problems? I’m considering taking a short holiday in Fukuoka during a long business trip to Korea in October/November but my schedule will be tight and especially on the return leg back to Busan it will be a disaster for me if the crossing is cancelled. I know you have no crystal ball but I was just wondering how frequently you have see the service disrupted. There is pf course the option to fly with Jeju but I think the Beetle sounds like more fun…..
Yeah I’ve done it over a dozen times and I’ve never experienced a cancelled crossing or a delayed departure, there’s just been a couple of times when it took longer than usual due to heavy conditions one time and engine trouble another time. So I’d say it’s a reliable service for sure – main thing given your travel dates is to keep your eye on typhoons as that’s the main typhoon season. If a typhoon hits they definitely cancel, but there’s a good few days’ warning while a typhoon approaches so if one’s coming in at just the wrong time you can alter your plans. If you have some flexibility with your dates, plan it for November rather than October as October gets most of the typhoons. Thanks for that Simon. That’s reassuring. Also thanks for the update about the DirectFerries webpage – I’ll definitely use that when I am booking. It’s likely going to be the end of October for me. I might return the boring way and take a flight back to Seoul from Fukuoka as I need to get there next. But, definetly looking forward to the Beele on the outbound leg. Simon. i really thank you mercy to your information here i feel safe to leave on Sunday for the First Global Symposium on Urban and Territorial Planning by UN-Habitat. I you have an account send me it on my e-mail, i wanna really support your good will to inform people around the world. I think you are using your own money even in getting Internet. Thanks for your kind words, glad you’ve found my site useful. If you’d really like to support it, you can donate via the ‘Buy me a coffee’ button on this page. Very much appreciated! How did your trip on the JR Beetle go? Just for your information (and other people’s in this thread as well), I just noticed the JRBeetle web page has changed, and for good. The main page is still only in japanese and korean, but now under “Languages” there is an option for “English” which redirects to an external link to book your tickets, in English. I haven’t booked them yet for I want to take the Beetle, not the Camelia Line, and the JR Beetle timetable only gets as far as September. I’ll have to wait until november to book my tickets and see how it all goes. I hope you all find this helpful! Glad you found it useful. Thanks for commenting with the heads up – yeah they just changed it a few days ago, I’ll be redoing this page as soon as I have time! December’s a good time to visit – you can still catch the autumn colours in Tokyo & Kyoto in early December, and you can also get some skiing in if you’re into that. Where did the instructions (Japanese to English) to do this yourself go? The last time we spoke, my understanding was that you thought agents (inc. direct ferries) would charge a premium that you thought could easily be avoided? They suddenly changed their website last week so I had to delete the instructions. I was going to redo them for the new version, but to my surprise it’s actually cheaper now to use Direct ferries – not sure how they do it but they have it for only 60 dollars, so it’s definitely the best way as things stand, in terms of both price and ease. 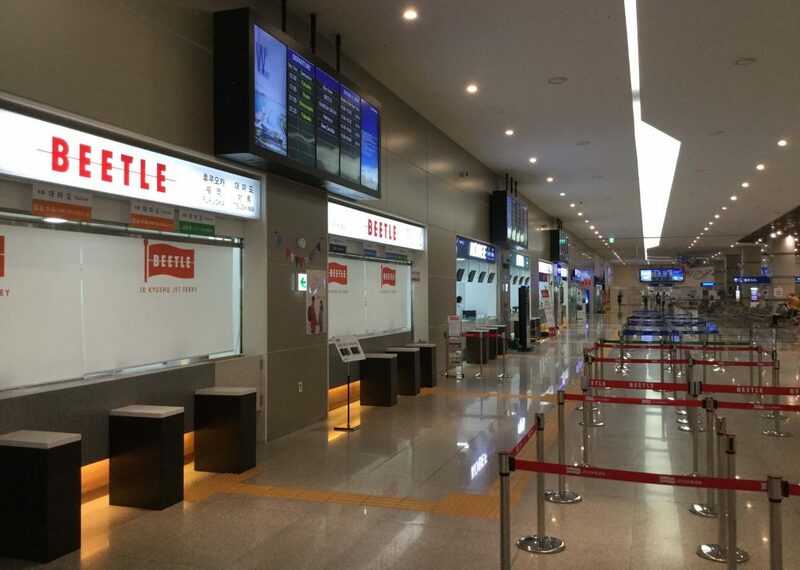 I actually just came back to Korea yesterday on the Beetle (I’m writing this in Busan), I booked it a few weeks ago on the Beetle site for 90 bucks so I’m kicking myself for the 30 bucks wasted! 1. What do Best, Good, Prime and Regular reservations mean? 1. Best, good, prime & regular are the ticket prices. There’s no difference between them in the actual service you’re buying, it’s just the price it’s available at. Usually you only get ‘best’ or ‘good’ when purchasing a return ticket, then there’s a certain number of ‘prime’ seats per sailing (I don’t know how many), and after that it’s ‘regular’ i.e. full price. Remember to check Direct Ferries too to see who has the best price. Hope this helps and fire away with any further questions. Hi Simon! Thx for a great post. I just have one question, Im taking the ferry in February and tried booking a ticket a couple of days ago via DirectFerries, but they keep changing the price! I get e-mails saying “our estimation was wrong, here’s the new (more expensive) price. Just wondering if this is normal? Hmm, sorry I’m really not sure to be honest – I’ve never had that happen, perhaps because I’ve never booked that far in advance. Are they changing it based on exchange rate fluctuations? That would seem fair enough I guess. Have you already been charged? Hi again! Thx for your answer. I don’t think it’s because rate fluctuations, every price change is to big for that, 15 dollars/e-mail. They say they need to “check the price with the operator” and then change it. When I asked “When do you know the final price” they couldn’t answer. Im not charged but the amount is on authorization hold. Maybe it’s because Im booking so far in advance, but as I’ve understood it I need an outbound ticket from Japan when entering the country (Im going there in a month). Ok yeah that’s definitely too much to be exchange rates. As I said I’ve never come across this, I can only guess that it’s the 3-month advance time. Regarding onward tickets, I’ve entered Japan maybe a dozen times, never with an onward ticket booked – and it never came up, until my most recent trip a couple of weeks ago. When leaving Busan (on the Beetle) I had to sign a form accepting all resulting charges in the event the immigration officer in Hakata wouldn’t let me in. But they did let me in, with the usual 90-day stamp. How much did you get it for when you made the initial reservation? Hi, Im traveling to Korea from Japan in a month and im wondering about baggage size? I understand that there is a 20kg weight limitation but my suitcase is quite large (80cm)and i am worried they wont allow it on board. Have you dealt with this before? Super excellent information and great details. Much appreciation! I’m so glad to find your website! 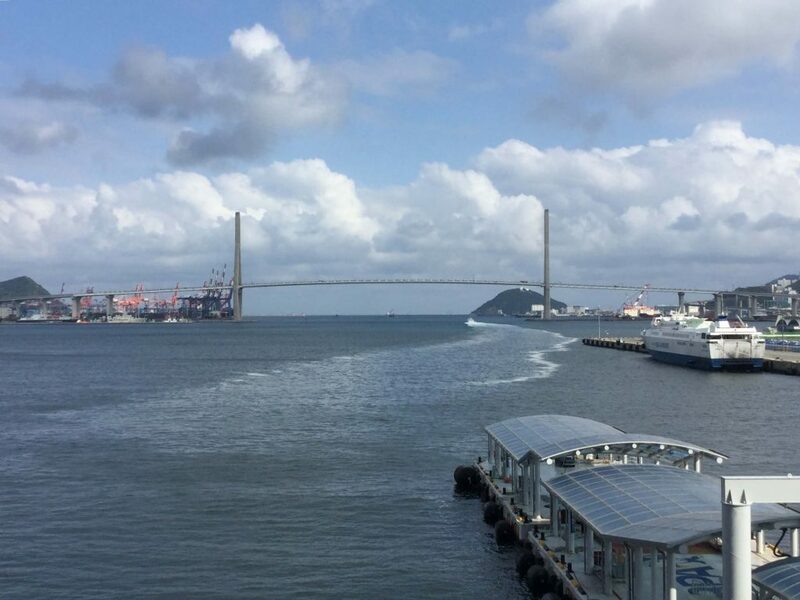 We’re planning to take the ferry from Hakata to Busan. 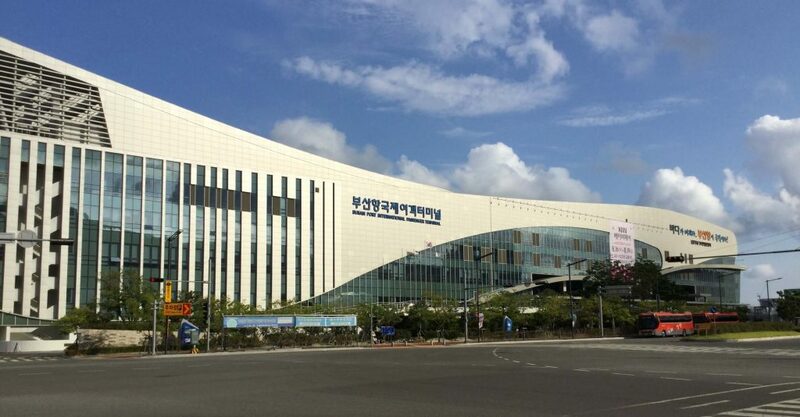 How far is the port to the airport, we’re flying to Jeju from Busan this May. Thanks! 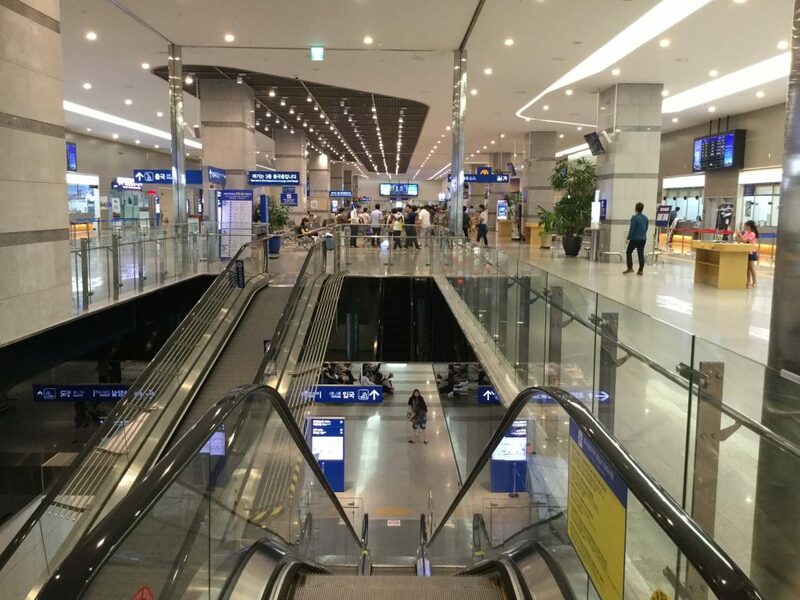 Busan’s airport is actually called Gimhae International; Gimahe is the neighbouring city, but the airport is on the Busan Metro system. 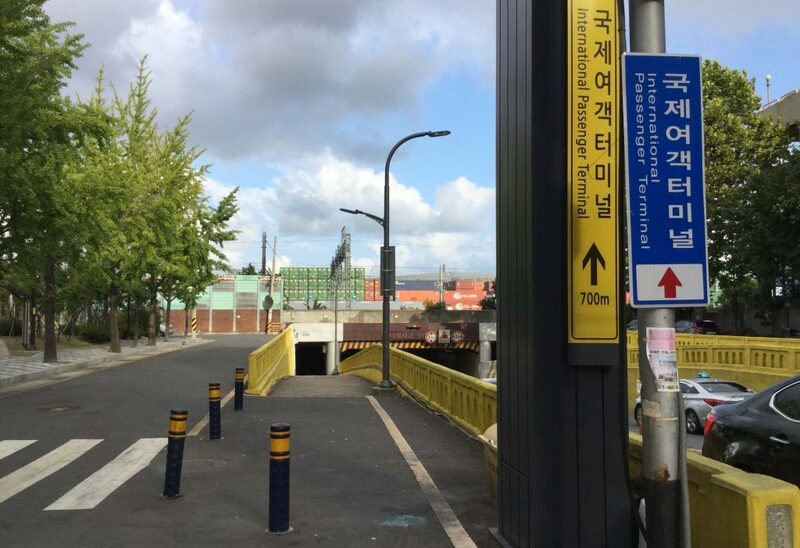 To get there from the port you need to walk 15 minutes (or take a 5-minute taxi) to Busan Station or Choryang Station, then the subway from there. 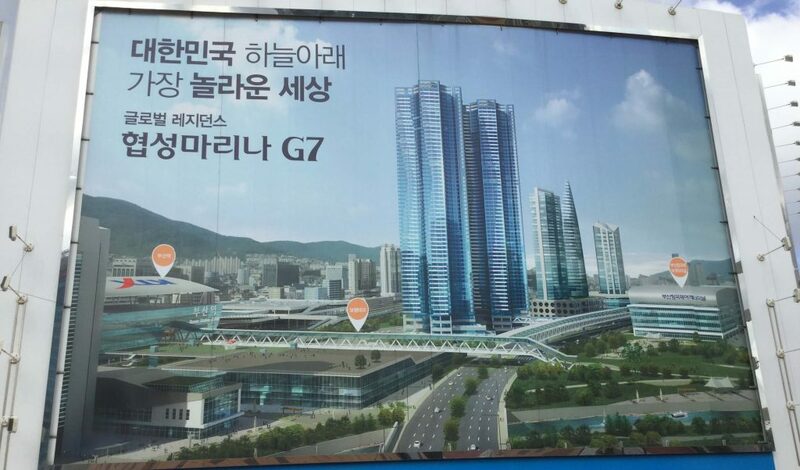 Orange line > green line > purple line, changing at Seomyeon and Sasang, journey time is 40 minutes. So say about an hour in total or slightly over. Thanks for your reply Simon! Hi, do the ferries run all year round? We are travelling in early January.